Join us in Silsbee, TX on Saturday November 12th for our Fall Fireworks Demo. Be the first to see the wholesale fireworks line-up for 2017. 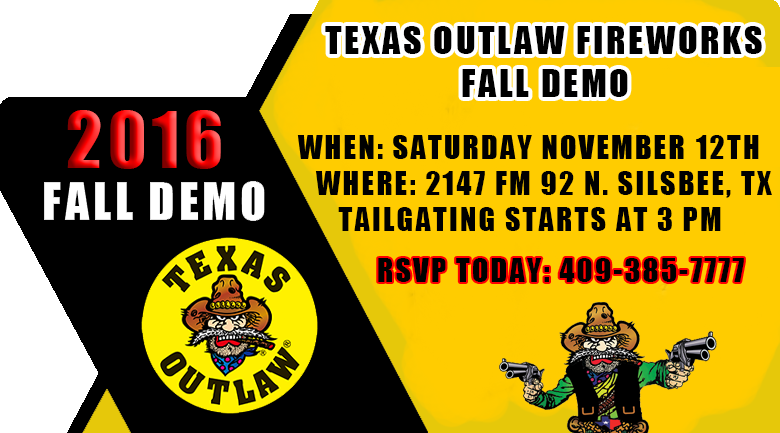 The event will be held at the Texas Outlaw warehouse 2147 FM 92 N. Silsbee, TX. You can RSVP by calling 409-385-7777. For the first time in recent history Texans are able to celebrate Texas Independence Day with fireworks. Thanks to recent changes in state law that opened up additional fireworks selling seasons. The new selling seasons include the days leading up to Texas Independence Day, San Jacinto Day, and Memorial Day.